We know, we know – it’s about freakin’ time! 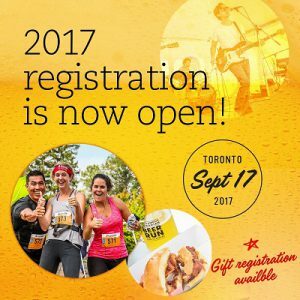 But the wait is finally over and registration for the Famous Canadian Beer Run is now open! This year we’re bringing out the big guns – tripling the number of beer and food vendors, licencing the ENTIRE west island of Ontario Place for our post-run party and changing things up with a brand new 5KM course. Live entertainment, craft beer, great friends and a waterfront course with views of the city skyline – it’s the perfect way to spend a fall Sunday! First 300 registered get a free “Run Hoppy” toque!